Multitudes of potential students are found online these days--tweeting, blogging, MySpacing, and Facebooking--but marketing to these prospects in their native environments isn't as simple and straightforward as it might seem at first. Diane McDonald, associate director of marketing at Texas A&M University, explained that reaching these prospects via social media takes more than a static institutional Facebook page; it takes an active approach to engage them. With an eye on increasing admissions applications, in late 2008 McDonald launched a new marketing campaign via a microsite called Do You Wonder? 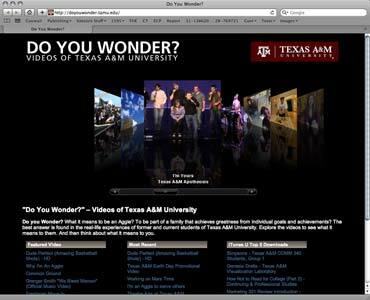 It features audio and video recordings of various aspects of university life and student activities. "The vision was to create an online campaign that would put our students as the face of our marketing," she said. Functioning as an auxiliary to the main campus Web site, some content is from the university but is weighted with student- and alumni-generated content to provide potential students with a first-hand look into the lives of real Aggies. "This is not a marketing puff piece," said McDonald. "It shows the real experience that future Aggies can relate to. We're out to create 'community with spirit.'" With video content powered by YouTube and the audio by iTunes, there aren't any technological hurdles to overcome for the intended audience. "People already know how to use these platforms," McDonald said, so the familiar interface feels welcoming and natural. Prospects were driven to the microsite rather than the main campus Web site with online advertising and television spots aired during A&M football games. Some ads were placed on the study guide Web site SparkNotes and other online sites where students go to learn about different colleges and the admissions process. McDonald's next strategy was to tap into the viral nature of social networks by reaching out to the new influencers--those students who are already widely connected via social media networks. "There are hundreds of thousands of Facebook fans or MySpace users," she said. Photo Web site Flickr and sites like Digg, Twitter, Blogger, and LinkedIn factored in, too. "People post, they have conversations, and those posts and conversations go out through their circles of influence." If one person becomes an evangelist for Texas A&M, that message goes out to his circle. Those who like it then spread the message to their circles, and so on. And all of it drives traffic back to Do You Wonder? and reinforces the original marketing campaign. This "Word of Mouse" style campaign, with its potential to reach an incalculable number of "touchpoints," is enthusiastically described by McDonald as "almost like chaos." As people become engaged and aware, communities are created and content becomes more targeted. "Everything won't appeal to everybody, but something will appeal to niche audiences," she said. It's quite unlike a traditional direct mail piece, which may or may not get shared with other people or strike the right responsive chord. McDonald, who presented a session on the topic at the recent EduComm Conference in Orlando, surveyed her attendees and learned that 80 percent to 90 percent had an institutional Facebook page. But leaving it sit there, static and unattended, is too often what many universities do. "There's a big difference between having a presence and running an online social media campaign. I haven't run into too many other schools who are doing what we're doing," she said. Texas A&M, which serves nearly 50,000 students at six regional centers across the state, takes pains to keep its microsite loaded with content, dynamic and continually refreshed. McDonald spent money to launch this new marketing approach, outsourcing the production and initial maintenance of the Do You Wonder? microsite. Eventually, it was moved in-house where activity is now tagged, tracked, and monitored internally. She said she regards as vital the support she's received from university leadership, an active response from the school's Web team, and the fact that subcommunities within the larger university have established and embraced their own social media sites, "greasing the skids" for her effort. McDonald couldn't share hard numbers on the impact of the campaign but said unequivocally that traffic, inquiries, and applications at Texas A&M have increased. But, "Is all the growth due to this?" she asked. "It's hard to say. It's too early to say. Measuring the effectiveness of traditional marketing has years of research behind it. There's not a lot of published research for this approach." McDonald cautioned those who would pursue social media marketing that execution is more work than it might first appear. "You think it's easy. Facebook and Twitter are free. But it takes a lot of creative energy and time to keep everything fresh and maintain a positive message," she said. "We regularly stay on top of it." But to achieve and refine marketing goals and methods, additional personnel might eventually be required. According to McDonald, the first key to social media marketing success is to create a branding strategy. It will drive how your campaign is facilitated and make sure there are no conflicts in your message. "You don't want to confuse the audience," she said. "You want to be authentic and stay true to the core values of your brand." Despite the fact that hundreds of institutions of higher education have jumped on the social media bandwagon, McDonald advised that there is no silver bullet, not any single thing that can lock in marketing success. Indeed, she said she believes it's all the little things that add up. "It's like the iTunes Music Store. There are hundreds of thousands of songs out there, and each one may not be purchased a lot, but add it all up, and there's a big impact," she said. "The more variety of offerings you have, the more people it pulls in, and it's powerful." This new approach, which McDonald likened to "citizen marketing," is more interactive, fluid and educational--for its managers as well as its audience. For example, when searching for YouTube videos, McDonald said, "You learn a lot about what people are saying about your university. That's really fun. And sometimes surprising." Critical to the evolution and growth of a social media campaign is to maintain what you currently offer, keep it fresh, develop new, innovative programs and ideas, provide accurate information, and continually evaluate what is cost-effective. "You have to be willing to change, to learn from your efforts," McDonald said. "The platforms keep changing, and you need to stay on track of what new technologies can offer."